If you’re already using SignUp.com to organize your volunteers, but want to expand beyond that core group of die-hards, social media is the answer. The range of popular social media platforms available makes it easier than ever to connect with the people most likely to engage with your group's volunteer for and help spread the word about your cause and your events. Of course, making the most of social media requires more than just setting up an account and occasionally posting. Follow these tips to expand your participant network and get the word out about your events and causes. Find Your Audience: Before you choose which platforms to focus on, think carefully about the people you’re trying to reach and do some basic research on your options. With 62% of adults in the United States using Facebook, that’s a good starting point for most groups. But, you can hone much more closely on your prospective volunteers and donors. For example, women are more than three times as likely as men to use Pinterest, and those with above-the-median incomes dominate LinkedIn. Don’t Just Talk—Engage: One of the biggest mistakes organizations make when using social media for promotion is using social media only for promotion. Social networking is relationship-based, which means that if you want others to follow you, share your content and otherwise engage, you have to do the same. And, you have to share more with them than notice of your events, volunteer needs and fundraising campaigns. On Twitter, for example, only about one in five of your tweets should involve direct promotion or solicitation. Rally Your Existing Troops: The power of social networking lies in its potential to spread information from one circle to another (and so on). That sharing has to start somewhere. This is particularly important on Facebook, where even those following your page will only see about 10% of the content you post. The more those posts are liked and shared, the more visible they become—so ask your core volunteers to visit your page regularly and interact with the content you post in a variety of ways. Whichever network you’re using, rely on your trusted staffers and volunteers to jump-start the conversation. 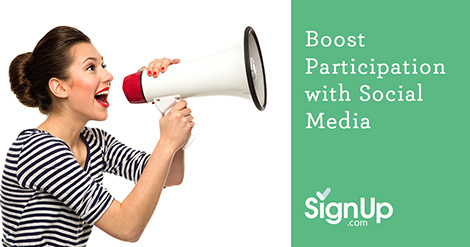 Use Social Media to Boost Your SignUps: Use social media to spread the word about your SignUps. Post direct links to your SignUp links on Facebook and Twitter and use images on Instagram and Pinterest to get more engagement. Then ask key participants to spread the word. Sharing links is a easy and quick, and odds are that your current participants would love to help --all you have to do is ask! Plan Your Content: Too often, social media management happens in fits and starts. A flurry of good posts is followed by radio silence, and then one day there’s a lot going on and 20 tweets or half a dozen Facebook posts go up in just a few hours. A Facebook page, Instagram or Twitter stream that hasn’t been updated in months creates an impression of disorganization and inactivity. Several posts in an hour, unless you’re in the midst of a very big event, can be overwhelming and trigger unfollows. Pace yourself to build an engaged following. Although social media may first bring to mind networks like Facebook and Twitter, there’s more to social media than posts and links. Instagram and Pinterest create excellent opportunities for using compelling visual content, and Americans watch hundreds of millions of YouTube videos every day. Don’t limit your content to traditional formats, especially if you’re trying to reach Millennials.